Every time I renew my blog domain, I wonder how long I will keep doing this. It's not that I have plans to quit blogging any time soon, but I will quit eventually. I just don't imagine myself as a 90-year-old blogger, and I'm sure nobody would want me to be. 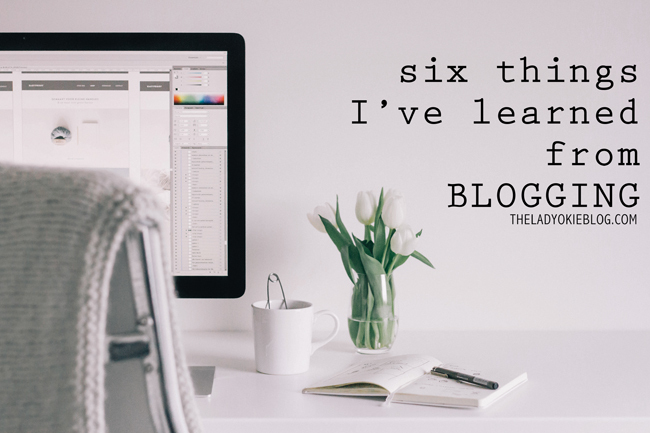 I started this blog in May 2010, and over the past five and a half years, I've seen a lot of blogs come and go. Some of them I miss and am sad to see them leave, but others have been gone so long that I've completely forgotten about them. I would like to think that if I were to leave, there would be a few people who would be sad about it, but realistically, after time has passed, I know my blog will just be lost to the void and forgotten like the rest. That's not me fishing for compliments or trying to be depressing; it's just a fact, and so sometimes I wonder what the point is. Is it a waste of time to spend hours writing blog posts if they will eventually fall into the black hole that is the Internet? Some people would probably say that it is, but I don't see it that way. I was out for a run a few weeks ago (blog post about running coming at you next week!) and was listening to a podcast about blogging. It was a husband and wife team who used to have an extremely popular blog (I'm talking millions of followers) until last year, when they quit seemingly out of the blue (some of you might have listened to the same podcast and know I'm talking about Young House Love). They said something on the podcast that stuck with me. They said that even though they stopped blogging after seven years, they don't see it as a waste because they learned so many things that they now use in their lives after the blog. They said blogging taught them skills and life concepts that they would not have learned if they hadn't kept a blog. They also said that someone with a blog of any size, big or small, can learn things from blogging that they take with them. I had honestly never thought about blogging that way, and I found it really encouraging, so I started thinking about the things blogging has taught me and the things I've learned that won't go away even after this blog does. The reason I started a blog in the first place was because I wanted a place to write. I edit all day, and sometimes it's nice to just write. Without a doubt, my writing has evolved over the past five years, and I feel (and hopefully you do too) that it has gotten stronger. I think I'm a good writer, and blogging is a great way for me constantly practice getting my thoughts down on paper (or screen, as it were). When I started this blog, I just used a point-and-shoot camera and didn't do any editing. A year or so into blogging, I bought my first (and still only) DSLR and immediately switched to manual and never looked back. I am not a professional by any means, but I am completely self-taught, and blogging has been a huge part of my photography journey. Having a place to share my pictures inspires and motivates me to try to learn how to take good ones. Without this blog, I would have no reason to learn how to use Photoshop. I specifically remember seeing a blog in my early days, and she always had fun captions and things on her photos. I was like, How is she doing that??? I found Photoshop Elements on sale one day and watched YouTube tutorials to teach myself how to use it. Since then, I've used Photoshop for a lot of things, a big one being editing and cropping photos for my scrapbooks and Project Life, and I would not have known how to do it if I hadn't learned for blogging. I have never paid for a designer to create images or headers for my blog. Nothing at all against designer or people who hire them, but I am really proud of myself for learning HTML coding to be able to set up a basic look for my blog that I actually really like. Most recently I figured out how to make drop-down menus for my blog header (using a tutorial I found online). Knowing basic HTML has helped me in my professional jobs, believe it or not! I definitely can't do a lot of the fun design things that professionals can do, but I know basic coding, and I would not know how to do that if it weren't for the blog! Admittedly, it's easier to stay in contact with blog friends if you are both, you know, blogging. But I feel like I have relationships with some of you that will continue after the blog. Beka is one person who comes to mind. She is such an encouragement to me and a good friend, and we would not have met if it weren't for our blogs. When she lived in Oklahoma, we would get together and hang out, and it was so fun! On a similar note, I have been so encouraged by the comments and feedback I've gotten on some of my more serious posts. If you couldn't tell (ha!) I am an external processor. Jordan processes internally, so this is always a struggle for us. Blogging has helped me to get my thoughts together and process what I'm feeling, and having you all respond and say you get me has been a huge blessing. This is an intangible result of blogging, but I have without a doubt learned a lot from being part of the blog world. I have learned to see things from another perspective, I've learned about new recipes and DIY projects, and I've learned about new ways of doing things. The Internet is a big place, but being part of the blogging world and having "regulars" that I read on a daily or weekly basis has been really fun. There is no way to really tell just how much blogging has changed my life, but all I can say is that it definitely has changed it for the better. Just because I don't have millions of followers or make thousands of dollars off this blog doesn't mean it has been a waste of time. I have learned skills that have been useful in my professional career and in my life in general, I've made new friends, and I possibly even made an impact in someone's life who comes and reads my writing. What have you learned from blogging that you will have after your blog is gone? Or if you don't have a blog, What things have you learned from your hobbies that are useful in other aspects of your life? I hope this way of thinking about our hobbies is encouraging to you as it was to me! I like the idea of trying to keep track of blog friends in my/their post-blogging life--social media would help a lot with that! A few of my blogging friends are now my friends on Facebook, which is the social media I use most frequently. There are a couple people that I would love to meet in person, and they're only a road trip away! I love this post and although you're not looking for compliments, I would totally miss your blog if you quit. I started my blog because of infertility. I write, but I don't really know that it's any good, it's just my thoughts and feelings on infertility, adoption and sometimes, when nothing is happening with those two things, on life in general. What I've found with blogging though, is a real sense of community. People that get it and totally understand me and support me even though I've never "met" them. It's the best thing I've decided to do in a long time! The first thing that crossed my mind when you were talking about why blog if eventually it's going to go into the black hole of the Internet is I may not miss your blog but I would certainly miss you! I love how blogging has connected me to so many wonderful people and though some may think it's weird, blogging friends are the best! Also, your post kind of made me reflect on what I've learned even in my short two years of doing it. I'm right there with you that I'm proud of the HTML I've learned and because of the skills I've learned blogging, I've done a complete re-do of our floor's website at work and it's been really helpful for our whole floor. Pretty neat and I've never really thought about it like that. Fun post! Yes! I listened to that podcast too and wanted to weep because I miss YHL so much. I am with you on all of this. It's funny that you wrote this, because I've been chewing on all the same things lately. I'm so glad that I have my blog if for no other reason than to keep my writing skills fresh. I have also stubbornly refused to buy a blog design and have instead learned some basic HTML. I'm always so proud of myself when I figure something out. It may look like a kindergartener designed it, but I don't care! I did it myself! I started teaching myself how to shoot in manual a few years ago, and I started to get decent at it, but I kind of stopped since I didn't always want to drag my camera around. I tried to do it again a few months ago and realized I forgot everything. I should probably work on that again. But yes to all of this. I kept nodding along to every point you made, because I feel the same way. In addition, I also find that I have become a more confident person because of my blog. It's scary to share personal details about your life, but I always feel so much better after I've done so. Knowing that it not only helps me, but other people to feel understood and less alone is huge. Blogging is so rewarding, and something I will never regret! I hope that one day I can add photography to my list, but I've definitely learned so much about html and I sincerely hope my writing has gotten stronger. A lot of the marketing/social media things I've learned from blogging has always helped me in my 8-5 job, so that's been a plus, too! this is so true...i've learned a lot more about design and coding from the blog... and had a place to practice all of it! i've never really thought about it that way. but i definitely agree it's not a waste of time. i'll always have my blog long after anyone else reads it... to look back on my life and memories and that is just really cool to me! even in like 30 years if i go back and read posts, i can see how i've changed or grown since then, and i can see how God's worked in my life. so it is never a waste of time! Yes to 5b, especially! I was just trying to explain this to my sister-in-law the other day. I'm an introvert and very introspective and I DO process a lot of things internally, but on the other hand I have always liked to write and have found blogging to be a good way to externally process things rather than going in circles in my head. I feel like most people who know me wouldn't really understand why I blog, since in real life I'm not one to really talk things out, but I've realized it's not so much that I don't want an external outlet to process things, it's just that I'm not a talker and writing is more my medium. I'm still learning a lot about blogging but I've learned a lot from other blogs, if that makes sense? About running, but also life in general, cooking, house stuff, child rearing, etc. I love being part of this community where we all share ideas and thoughts on a variety of subjects. It definitely makes me think differently sometimes, even when I'm very stuck in my own view. I've seen a few posts in this line of thought and I've never really understood it. Why does it have to have a point? Do you enjoy it? Then it had value. I think you're absolutely right and it's a fantastic resource for learning (both things about yourself, blogging, and writing, but also just general life principles, tips for how to do things, and any hobby you have a remote interest in). But even if it wasn't, wouldn't it still have value just for the enjoyment of the thing itself? I see your point and yes, of course it still has value for the enjoyment factor. I mean, there are TONS of things we do that have basically no real "value" except for enjoyment (skydiving comes to mind!). But I spend HOURS working on this blog, and it helps to know that even after it's gone and forgotten, it still had tangible value in my life. The things I do like skydiving that take a few hours of my day and that's it are fine to just have enjoyment value, but I liked thinking about how blogging has made an impact in my life even beyond just merely the enjoyment factor. I had never thought about blogging in the way I had on the podcast... that I have learned skills I would not have otherwise! Yay for #5! I'm so glad God connected our blogs where we can be friends in real life and in blog land! I'm still super excited to come home and visit you and see R. So fun! I'm proud of you for learning HTML. I can't figure that out but I haven't spent that much time on it either. It intrigues me so maybe someday I'll learn. I'm glad you were able to reflect on what blogging has taught you. I think it can teach a lot and I bet you have more impact for Christ on people than you realize. We might never know on this side but being a light through blogging is a unique opportunity and I think you do a good job of balancing Christ and normal life posts to attract a vast audience. Yeah! I have definitely learned and agree with ALL of your points. I wrote a post once about how blogging has changed me- and I feel like in addition to the things you listed, I have become more confident in myself, more open and compassionate with others, and have allowed myself to become more vulnerable and "real" than maybe I would otherwise. Which, most people say blogging does the opposite for most people, but it hasn't for me. I think it safe to say that my blog has been on a semi-permanent hiatus for some time now. Looking back, it's the friendships I've made that stand out the most to me. I've met some bloggers in person and while I fail to update my blog on a regular basis, I do a pretty good job of keeping in touch with them (some I talk to almost every week). Bloggers all have something in common (writing, sharing ideas, photography, food, etc.) and it's so easy to formulate a friendship and feel like you've known each other forever. I think blogging has taught me to pursue my passions. I probably never would have been into woodworking projects if not for my blog. It leads to good material but it is so much more than that, I test myself and push myself to learn more. I have loved the friends I have met and some I know I will be friends with for a long time to come. Good post, Amanda! Actually I think you would make a very interesting 90-year old blogger! One benefit of blogging for me is that I've visited a lot of interesting places that I otherwise would probably not have stopped to see. Blogging has definitely helped me to develop as a writer--and to learn that writing true stories is really where my heart is at. I occasionally write fiction, but due to blogging, the vast majority of what I write is true, and I love writing it--I've grown a lot since college days. I seriously considered stopping blogging after our most recent move, because life is much busier and much harder now than it has ever been, but I got so much backlash from family for even mentioning quitting that I decided to keep it up for a while yet. It's good to know there's some people who look forward to your posts so much! My photography has also improved immensely, that's easy to tell if anyone looks at posts from 2012, I've also gotten a better camera, but still no DSLR and still no manual settings. haha! love this post! i don't think i'll be blogging my whole life, and yeah i guess it will all get lost in the void. i get sad when people stop blogging, but yeah you're right - sometimes i plain forget about them. if i follow them another way, like instagram, and they still post, i don't forget about them, but out of sight out of mind, as horrible as it is. i have learned so much from blogging as well, and i think it's made me a lot happier because it gave me something to focus on when i needed it, if that makes sense. i haven't been doing it that long though. But all that aside, I never really thought much about what I've learned in terms of skills and growth when it comes to blogging. I mean, I've realized that making online friends is a VERY real thing and that sharing your heart helps create community, but I haven't really thought about the skills I've gained since starting. But reading your list really made me realize just how amazing blogging is. It not only helps us with our hearts but with our minds, too. Thanks for sharing this list! Thank you for this! I have not been blogging very long, and have virtually no followers. Cant say Im really trying to gain followers, but I enjoy just cataloging my thoughts through this outlet. Yet at times, I wonder is this really worth it, journaling so publicly (I have my written journal as well.) Through this post I see some of the things I can look forward to! Thank you for that! I love this. So true. I don't see myself blogging forever either, but I'm so happy about all the memories that I've written down and that my kids/family will be able to read in the future! I totally agree with you. Blogging is fun now, but I know it won't last forever. It's good that bloggers, even ones with huge followings like YHL, can step back from blogging, feel accomplished with what they've done, and move on. I know it takes up SO MUCH TIME and a lot of my brain activity, so I know I won't always be able to keep up with it. But I do love what I've learned from blogging. It's been such a great creative outlet, I've learned so much about coding and photography, and lots of other skills, which will come in handy should I enter the workforce again (probably).